Mrs. Willis is a graduate of LFO High School. 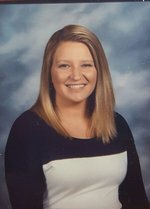 She completed her Bachelor's Degree in Secondary English Education from Kennesaw State University in 2011 and her Master's Degree in Instructional Technology from Kennesaw State University in 2017. She is currently pursuing her Specialist's Degree in Instructional Technology and will graduate in May of 2020. Mrs. Willis has been teaching at LFO High School for 7 years and has been teaching for 8 years. She has taught in the Special Education, General Education, and Gifted Education classroom settings.